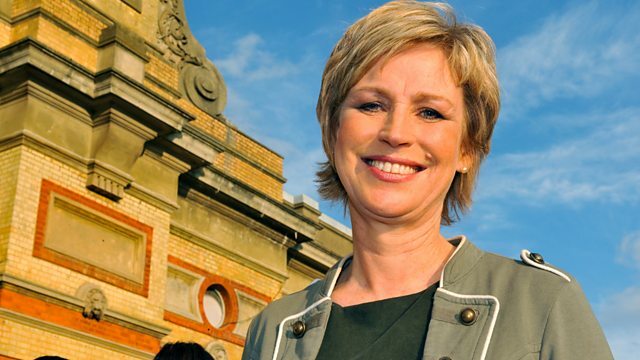 Sally Magnusson meets young people in Wigan on a mission to get the town singing for Christmas, and schoolchildren who are putting faith first. Browse content similar to Young Voices. Check below for episodes and series from the same categories and more! and the glorious message he brought of peace and goodwill to all. So join us as we sing some wonderful carols by candlelight. of Wigan together for a Christmas treat. and music to make a difference in their town. for leading us in that first carol so beautifully. We'll be hearing from her a bit later on. We're surrounded by talented musicians tonight. One of them is right here, Josh Hales. He's playing the organ for us this evening. And you're a graduate of the Wigan Music Service. How early did you start with that? I was eight years old when I started playing the cornet. which we got to have a go at. And I went home and I just said I'd really like to try the cornet. -Bit of a leap from the cornet to the organ. and thought I'd really like to have a go at that. and able to play that wonderful repertoire of religious music. Well, it means an awful lot. I find it very moving, to be honest, often. In all sorts of contexts. to accompany a full church or a cathedral of people, full organ. And Josh is going to be playing for us again now. from the young choirs who are with us this evening. a thriving school group aims to get pupils more involved at church. One of the pupils, Callum, is our young reporter. Welcome to our IMPACT group. but trust me, we know what we're doing. So we've got Tom, as well. Has anybody got any other ideas of how we can advertise? IMPACT stands for Involving More People At Church Today. Everyone needs to like our Facebook page. It's basically about getting the youth involved in the local churches. but we also include something like a social section of the day. getting to know the other members of the youth in the parish. On Sunday, before the Mass, we gather together and celebrate. We have lots of delicious cakes. to share in this experience of our Mass. what they originally set out to do. that would help and get more young people starting church. So that was when we came up with IMPACT. Why do you think IMPACT's been such a success? I think IMPACT's been a success because it's a one-of-a-kind group. There's so many people involved that are dedicated to their faith. And they're very happy to stand up for what they believe in. the older people that want to get involved, it's the children as well. And they all want to take an active role in their religion. we will come to know what the Lord is asking of us. Everyone's practised their parts. Now, it's time for Mass. It was Heaven that gave me these limbs. For the sake of His laws, I disdain them. with the sight of your glory, O Lord. because I think that's something that we lack at times. And I think it brought a lot of youthful energy into the church. kind of services more often. the IMPACT Group have even loftier ambitions now. 'The plan is a flash mob in our town centre of Wigan. and it will eventually be brilliant. in Wigan town centre? Just wait and see. Up and down the country, families are busy preparing for the big day. without Steve, the dad who's always been at the centre of their family. great photograph of him. What was he like? He was always a really happy person. He was so enthusiastic about things. He was never pessimistic about life. He always took life as it came. How did you find out that he had cancer? and there was no cure. to be any way to get through it. When he eventually did die, did you have a chance to say goodbye to him? did I want to go and say goodbye? Because we knew he wasn't going to last out the day. It was such a devastating moment for me, and I was crying. for about half an hour and I wouldn't let go. It was hard but I'd been taught well by my dad. and not to let anything stop me. And you were in the middle of your GCSEs at the time, weren't you? "You don't have to do this maths GCSE if you really don't want to." And I knew that my dad would've wanted me to do it. And I went and did it. Did you have a sense that you were doing it for him, in a sense? That was definitely the main thing that came into my head. that you see your own future? with this kind of cancer. -a doctor, trained in cancer. -What's kept you going through it all? is still watching over me. The weekend's beginning for a group of Wigan's teenagers. a church group exploring faith and forging friendships. -Emma's grown up with the church. You come and you just feel like you've come home. and you just feel totally accepted, totally at home. and you just want to get to know them more. a Christian community at the heart of Wigan. Nick joined two years ago. that hole that was in my life is now made a whole. These kids don't just hang out with each other on a Friday night. as well as a special Christmas message for the public. -Would you like some free sweets? -Erm, yeah, go on, then. "Don't just give a gift, be a gift." -That's brilliant, you know, that's a great ethos. -who our church is, our youth is. because the world can be an ugly place at times. -It's nice when people are giving free hugs. Can't do any harm, can it? a mustard seed, that you can move mountains. And...mountains! You've just got to have the faith in Him and the faith in yourself. from St Edmund Arrowsmith High School. embroiled in a surprise singing extravaganza - hopefully! It's going to be really good. has got wind that something special's planned. -are in for a big surprise when they found out what's in store for them. for brave soloist Lily and Sam on cornet. Amazing what can be achieved with a voice, bravery and belief. It's been fantastic this morning down here at the Wigan Grand Arcade. -Yeah, but I was more excited, if anything. -And did it go well, Niamh? -I think it did, yeah. I had lots of fun. caring for others around them. as you join in this final carol. You're bound to know it. from the Royal Albert Hall. voted as the nation's favourites. To see if yours is among them, tune in next week. Sally Magnusson meets young people in Wigan on a mission to get the town singing for Christmas, and schoolchildren who are putting faith first. She introduces candlelit carols from St Oswald and St Edmund Arrowsmith RC Church, accompanied by talented young musicians.